Media industry currencies nowadays mostly extend to audience measurement and advertising monitoring services. On top of these, however, WHITEREPORT expands the concept by including new market currencies and key performance indicators concerning the financial, commercial and ownership aspects of television, radio, print, digital, cinema and OOH companies, both at the media company and the macro-level. In the UK, the WHITEREPORT database includes public data about 1100+ UK media companies, excluding other players of the value chain (neither agencies, sales houses, news agencies, content production companies, nor distributors are included). The free segment of our online platform is designed to serve as an essential component of the decision-making processes that media market executives encounter every day, and it will allow them and all experts, analysts and stakeholders with a vested interest in this market to keep up with changing market realities and underlying trends. WHITEREPORT’s Key Performance Indicators with aggregated data will provide free weekly updates on four main indicators, complemented by our forecasts of the current and expected future performance of the media market. Focusing on the media market (e.g. 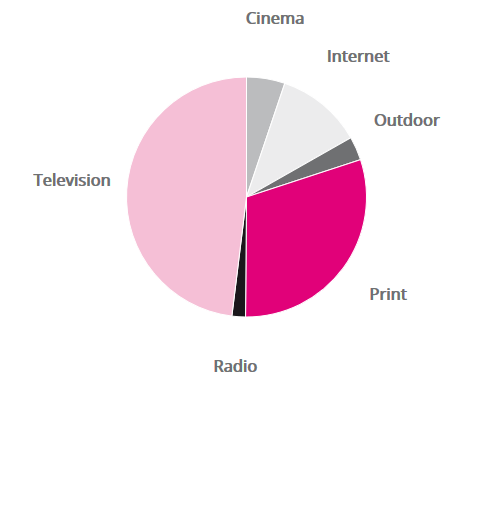 television, OTT, print, digital, radio, cinema and OOH) within the creative industry of the UK, we identified 1308 media companies (searchable in the Financial Module of www.whitereport.co.uk for subscribers). However, these media companies represent only the tip of the iceberg: the total supply of media products is generated by a vastly larger number of players, corporate or otherwise. Nevertheless, based on other indicators, in financial terms the 1168 companies we identified are estimated to be responsible for the bulk of the total market revenue. Whitereport KPIs provide data about the companies that own, control and operate the media brands we identified (media companies, such as the providers of television content, be it broadcast or OTT; internet and radio content providers; etc.). Please note that turnover data refers to the amount of consumer and advertising revenue actually received by the media company. This is generally less than the sum of advertising and consumer spending because fees paid to other players along the value chain (sales houses, agencies, distributors or other providers) are deducted from the original spending. Summary The total reported turnover of television, online, print, radio, cinema and OOH companies in the UK amounts to £29.4 billion: it is 8,7% increase year-on-year. This figure includes all types of media company revenues, from advertising all the way to revenues generated by end consumers (print, tv and online content subscriptions, retail sales of magazines, etc.) and other complementary revenues (events, etc.) Television content providers (including broadcast and digital platforms) make up the biggest share. The turnover generated by the television and print segments add up to 53% of the total turnover in the media market. With an estimated turnover of global media companies the market size is £5+ billion bigger, exceeding £34 billion. We’re working on the first update. Please sign-up to be informed.